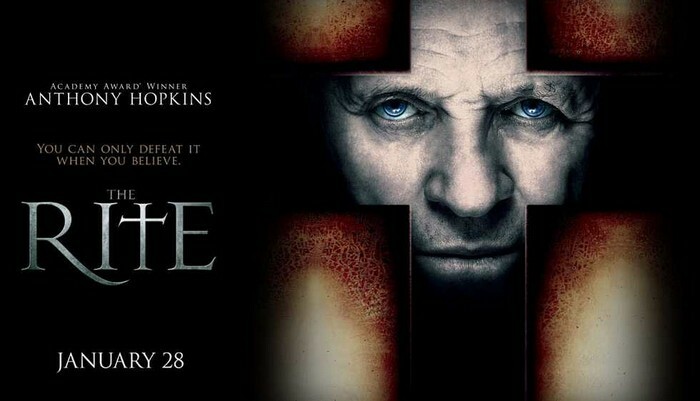 The Rite could have been a subtle, moody film about the Roman Catholic Church’s Rite of Exorcism. The Rite could have been a film about a young man looking for a way out of his doldrums hometown. The Rite could have been about an old man’s struggle with his own sins and failures. The Rite is almost all of these, but often gets in the way of itself. Director Mikael Håfstrom takes his time building the world and story around Michael Kovak (Colin O’Donoghue). Michael is a self-centered everyman. He signs up for the seminary just because he doesn’t want to stay in his backwater town prepping dead bodies for wakes at the family funeral home. It’s not the life I’d want, but it’s a stable living, Michael! So, Michael joins the seminary and gets a $100,000 education, for free. Towards the end of his education, Michael decides to resign, citing a lack of faith. 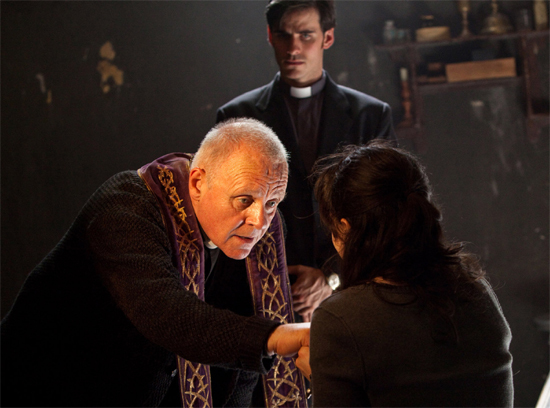 His mentor, Father Matthew (Toby Jones) convinces Michael to reflect on his decision and sends him to Exorcism School in Rome. Once in Rome, the story actually begins. The film takes about a half hour to get there. In Rome, Michael meets Anthony Hopkins’ Father Lucas. Father Lucas is a practicing exorcist in the not-so tourist friendly parts of Rome. Michael searches for proof that God and the Devil exist while Father Lucas attempts to exorcise a demon from a pregnant Italian girl named Rosaria. As the film progresses, subjects like celibacy, psychiatric care vs. exorcism and family duty all get brought up, but are never fully explored. While attending the class, Michael meets a journalist named Angeline (Alice Braga) who wants to learn more about why the Church started an exorcism school. Angeline has the potential to be a great character, but she serves the role of plot device more than anything else. Nothing really comes from their relationship aside from Michael needing some help during the film’s climax. The two could have debated belief in exorcism and playfully danced around Michael’s impending celibacy vows, but instead talked about Anthony Hopkins’ Father Lucas. In a scene where Father Lucas performs along term exorcism session on Rosaria, Michael tells Father Lucas he believes Rosaria needs a psychiatrist, not a priest. 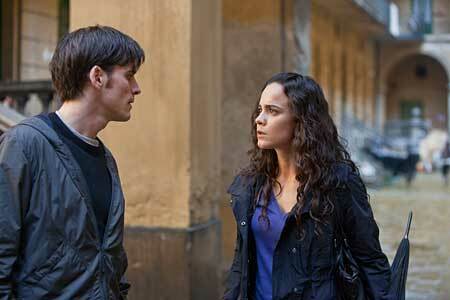 Father Lucas shrugs him off and says he’s a physician as well as a priest and that Rosaria is indeed possessed. The subject is brought up once or twice more, but a psychiatrist never examines Rosaria and the subplot just disappears. Michael, the son of mortician Istvan Kovak (Rutger Hauer), occasionally looks distressed when he thinks of how he abandoned his father. Truth be told, his father seemed to be pretty proud of his son. However, Father Lucas slowly becomes a father figure to Michael. Father Lucas though, seems to have his own demons. The story is pretty predictable and the only things that kept me with the film were the cinematography and Anthony Hopkins’ performance. The Rite, while muddling through developing its main characters’ motivations, does have a strong visual language. Predominantly shot in Rome, the film is graced simply by taking place within the city’s ancient structures. Cobblestone streets, exposed brick, gothic fountains and tight alleyways make for an atmospheric setting. Mr. Håfstrom and cinematographer Ben Davis use rain, snow and a red-eyed mule to maximum effect. Using both high and low camera angles, the filmmakers convey a spiritual battle between good and evil. One of the most riveting scenes in the film combines this use of angles and Anthony Hopkins’ considerable skills as a performer. Mr. Hopkins really gets to stretch his skills as Father Lucas Trevant. Mr. Hopkins is studious, whimsical, steadfast, kind and terrifying throughout the film. Father Lucas is a very complex character and it is a joy to watch him go from making playful verbal jabs at Rosaria to forcefully commanding the demon inside her to leave. This wasn’t just a payday for Mr. Hopkins. He really brings his A-Game to the role. Unfortunately, some of his quieter moments are marred by really loud demon whispers. The bombastic sound undercuts the film’s visual nuance. There are some genuinely creepy moments ruined by too much loud, demonic whispering (most notably the aforementioned evil mule scene). It’s too damn crisp and not nearly guttural enough! The sound design has all the subtlety of a grindcore Lady Gaga cover band. Visually, The Rite has all the trappings of a good horror film and Anthony Hopkins is fascinating to watch as Father Lucas. It’s one of my favorite performances from him in a long time. There are some truly haunting moments, even if the script lacks and the sound is overbearing. I recommend checking it out once it hits DVD and Bluray. Ian Gonzales is a big fan of horror films. In fact, he’s currently living one. It’s called “I’m 31 and I’m more psyched for a Teefury Dalek t-shirt than I am for Valentine’s Day.” You can follow him on Twitter: @iangonzales.